This year was my first-time decorating for Christmas, which is probably why I put up the tree before Thanksgiving because I just couldn’t wait! 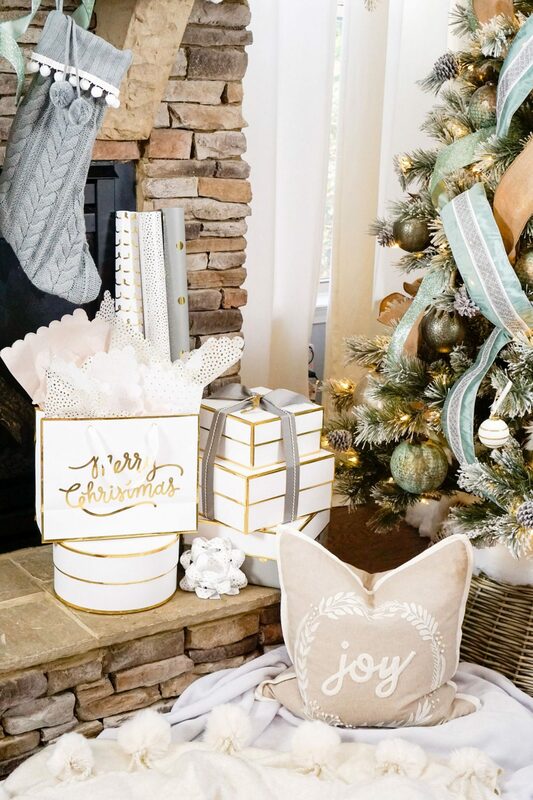 Today I am sharing our very first Christmas Decor Tour. I was planning on keeping our Christmas decor very minimal this year and wait until after the holiday to buy Christmas decor on sale, but I have a little more than planned to show you because of my thoughtful aunts! Two of my aunts were decorating a clients house for Christmas and I got to have some of the extra decorations, which I’m so thankful for because decor you only leave out for a month isn’t cheap. I still plan to shop for Christmas decor after Monday to continue decorations throughout the house. This year I only decorated the tree and mantel, but I want to eventually have Christmas touches throughout our home. 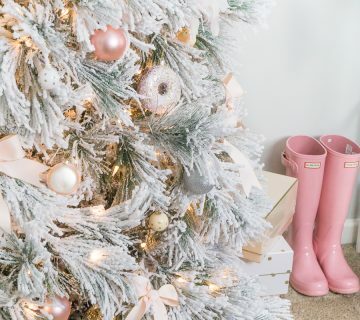 You may also be interested in following along with my Christmas decor Pinterest board if you’re looking for more inspiration. 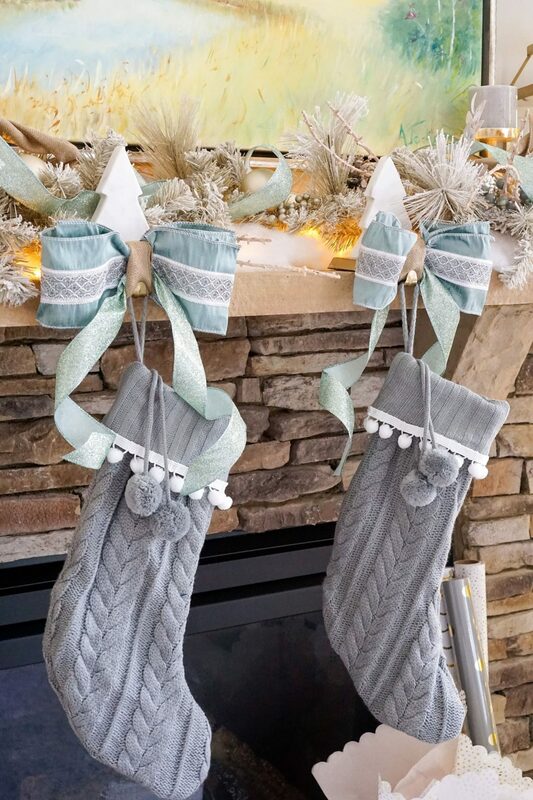 After seeing the pom-pom stockings from the Hearth & Hand collection but not loving the color, I tried to hunt down similar stockings that would work better in our home. I quickly decided stockings were overpriced, so I came up with a DIY option instead! I purchased these stockings at Target for $9. Then bought 1 yard of pom trim at Joannes using a 50% off coupon. I heated up a hot glue gun and added the trim to the bottom fold of the stocking. You could also use gorilla glue if you don’t have a glue gun, just be careful because a little goes a long way. In the end, I spent around $22 on these stockings. I may end up monogramming them or adding our names to them at some point. 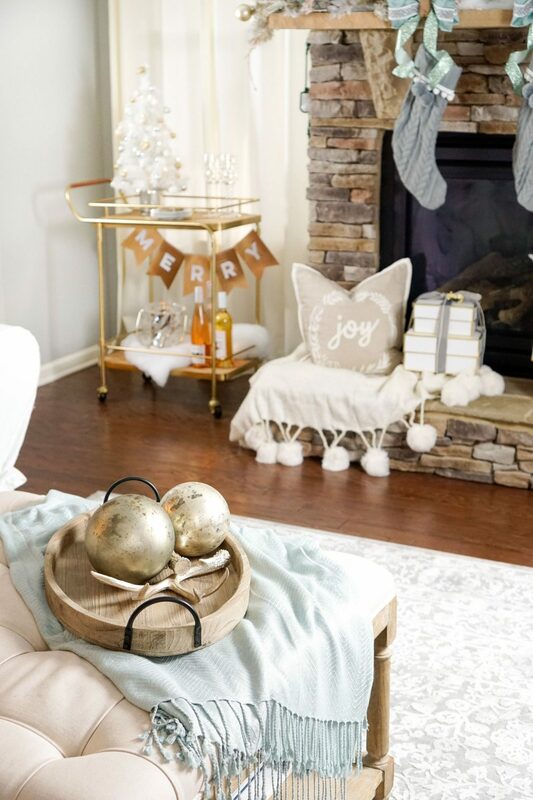 The garland above the fireplace was found at HomeGoods. It’s very gold toned which I love. I added the same ribbon from our tree to the garland to give it a cohesive feel. I also purchased our marble Christmas tree stocking holders from HomeGoods too. 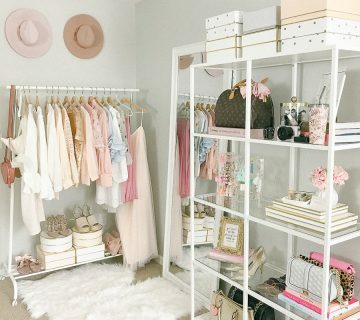 As you may have noticed, I’m a frequent HomeGoods shopper 🙂 I just shared all of my tips on how to score the best stuff at HomeGoods. Be sure to check it out for all of my tips! I purchased my Christmas Tree Basket at Ballard Designs during a 30% off sale. I figured hey, I didn’t have to spend a lot on decorations, so why not get the stand I’m obsessed with and will use for years to come! Because our tree stand is a little tall, I added in faux snow to fill it out. This was my first time using ribbon in the tree, so I just did what I could with it. I wouldn’t stress over making it look perfect, just cut long strips and tuck it in and out of the tree from top to bottom. Our tree topper looked a little bare on its own, so I added a big burlap ribbon to the top to limit the space between the two. Last week, I shared my Christmas Bar Cart, so if you want to see more details of the cute bar cart to the left of the fireplace then head to that post! All of our ornaments and ribbon came from a local wholesale decor store, Reeves. I found a few of them online at Nordstrom so I added them to the shoppable widget below. These ornaments are the real deal and a lot heavier than I was expecting! I also couldn’t resist this white and gold ornament set to go along with them. I actually ended up taking down the huge bows on each stocking holder after shooting and editing these photos. I used the scraps of ribbon I had left over to make them. 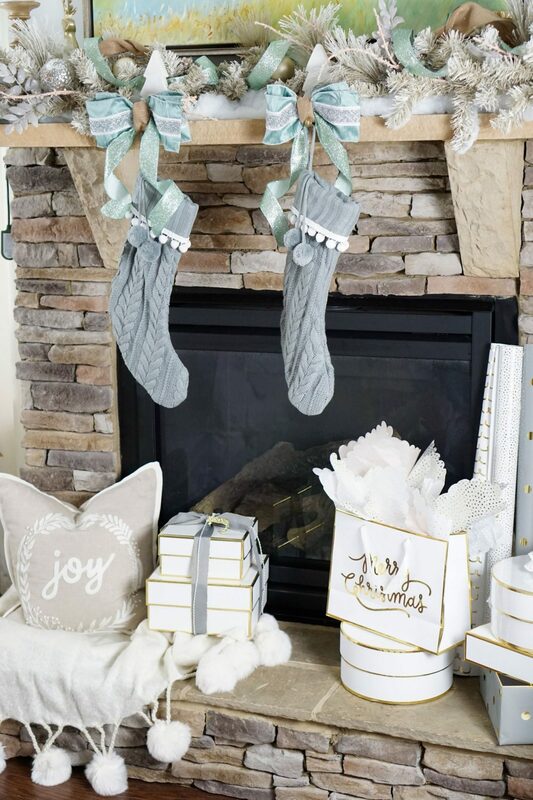 I originally used them to help keep the stockings from turning, but I decided it wasn’t a huge deal and I wanted to clean up the mantel a bit by removing them. 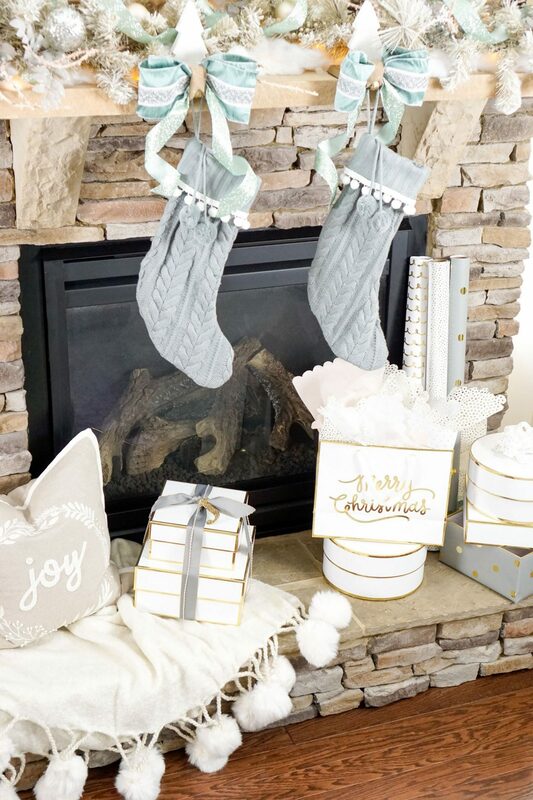 I filled out our large fireplace with my favorite gift boxes and a pillow I found at TJ Maxx. 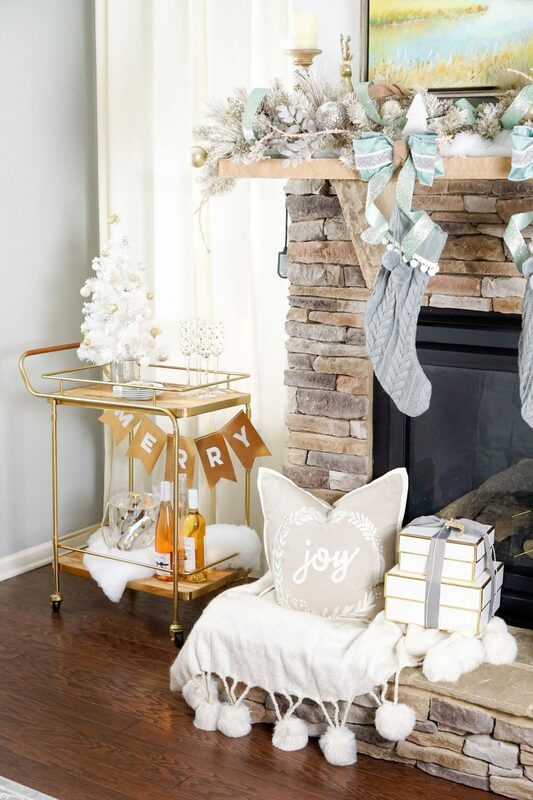 The faux fur pom blanket tied in perfectly with our stockings. Of course, as I write-up this post the blanket sells out! There are a ton of similar options online that I will link in the widget below and I bet it will be back at some point. I’ll be sure to give you the heads up when it comes back on my Instagram Stories! With extra ornaments, I laid three in various sizes on my wood tray with gold sparkly antlers found at Joannes. If you’re wondering where any of my furniture if from, hop on over to my House Decor Update post! Thank you for checking out my Christmas Decor. 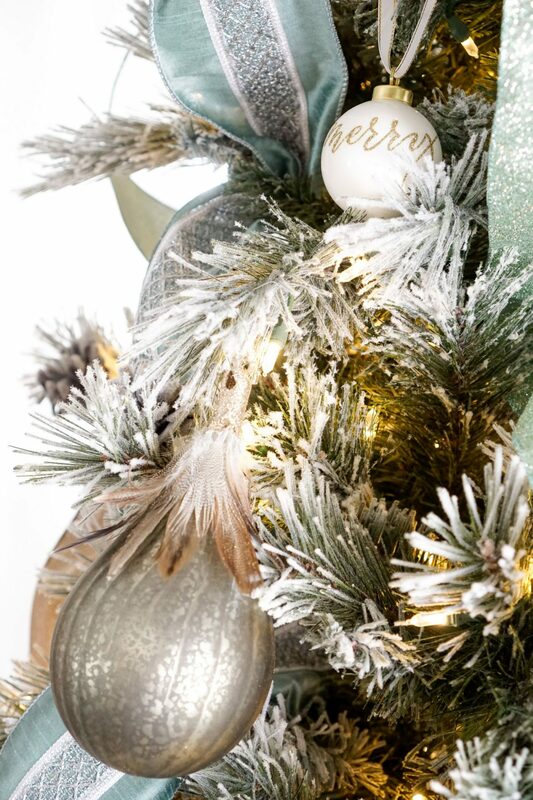 If you’ve shared your Christmas decorations I would love to see them! Share your link in the comments below. 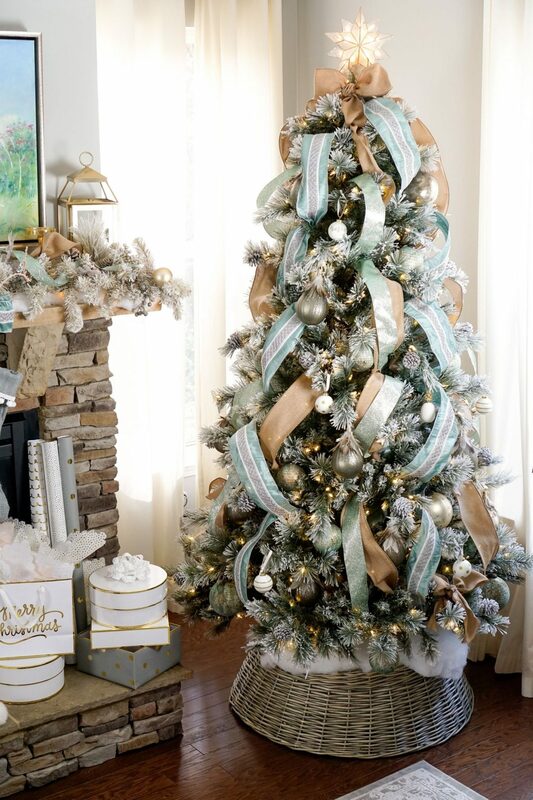 What a gorgeous tree to start off your holiday traditions. Even your fireplace is decorate so beautifully. The color scheme of everything is so lovely! Your home setup is BEAUTIFUL! I spy some adorable gift boxes (from Target)! It’s so bad that I know that, but I went round and round with myself almost buying them all last weekend haha. Loving all these muted blues! Awe I just love it!!! Wow your home is gorgeous!! We love how you decorated for the holidays. lovely! Gorgeous!! Loving your Christmas decor!!!! I love all your holiday decor!! 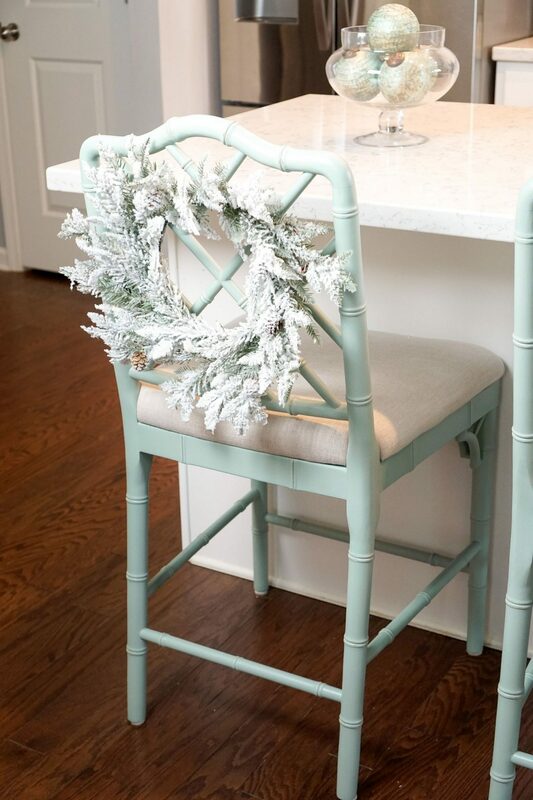 Your tree is beautiful and the wreaths behind the bar stools is such a great idea! What a gorgeous home! I love how you tied in such pretty, neutral decor! Totally my style as well. Your decor is to DIE for!